The green anole (Anolis carolinensis) is the only native anole in Florida and the United States. It is found in the southeastern United States. Anole is pronounced uh-nole, an-ole, or uh-nol-a. 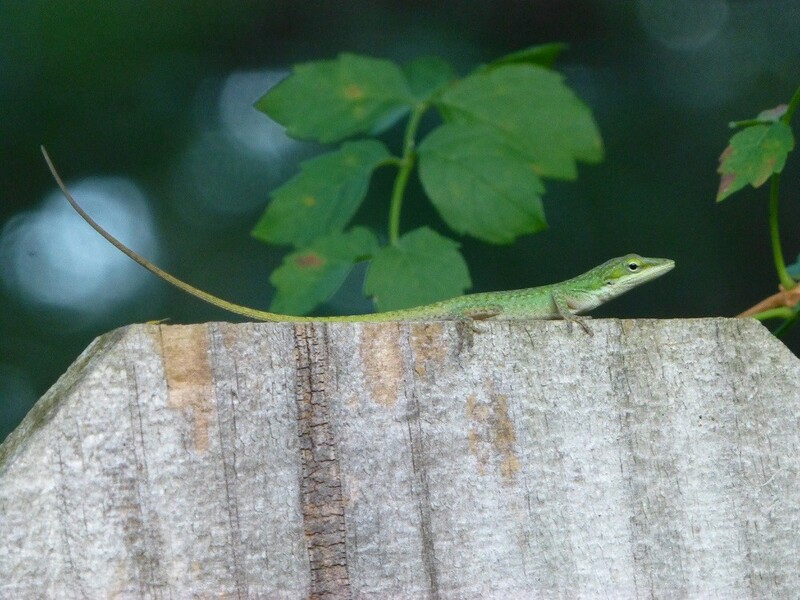 Green anoles in Florida are not as common as they once were because a similar looking, non-native lizard, called the Cuban brown anole is taking over its habitat. Many people confuse the non-native Cuban brown anole with the green anole, but there are many differences between the two. 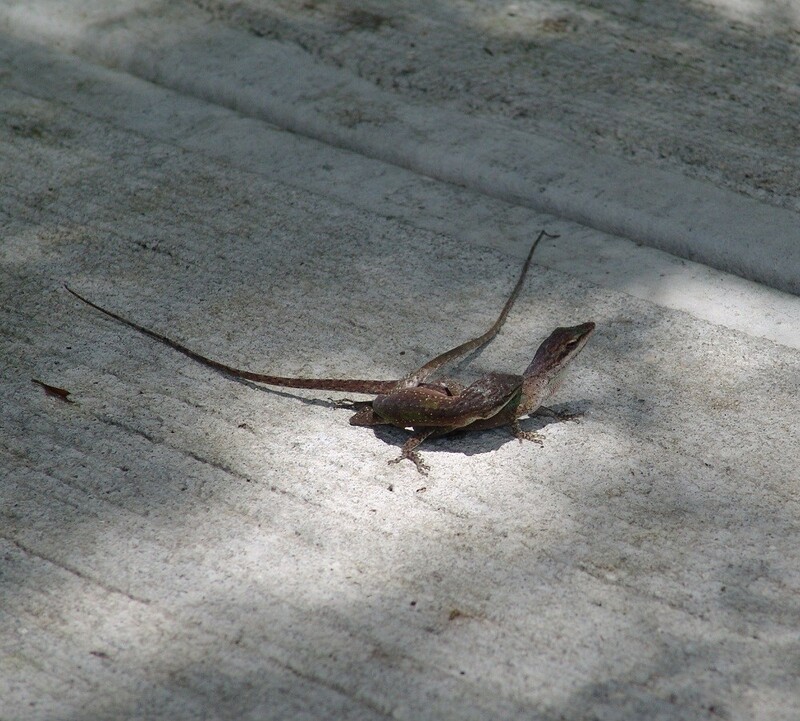 Green anoles appear similar to Cuban brown anoles but can change color from green to brown, do not have dorsal ridges, do not have splotchy or patterned colorations, do not have orange dewlaps, are not as wary of humans and pets, and do not reproduce at the high rate of Cuban brown anoles. The green anole is a slender, graceful, lizard that moves with a dignified confidence scanning the landscape with its large watchful eyes. 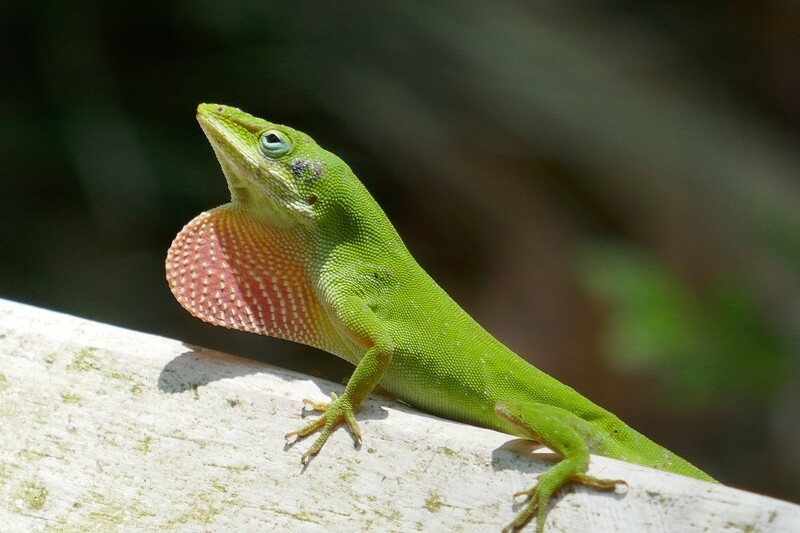 Green anoles ruled their Florida habitat virtually undeterred until the 1970’s when the Cuban brown anole began to invade their Florida habitat in a much broader range than just Miami and the Florida Keys. Green anoles are related to iguanas. They can change their color from green to brown and vise-versa. Their color generally reflects the color of vegetation they are on as a camouflage technique. However, color change is also dictated by temperature and emotions. Cooler temperatures, below 70 degrees, and stress keep them in their brown phase and once the weather warms up they stay mostly green. Confrontations with rivals will have the winner turning bright green and the loser brown. The hormone intermedin, which is secreted from the pituitary gland, is responsible for the change in color in their skin cells. Cuban brown anoles can only change to different shades of brown and never to green. The green anole has a long tapered head and tail and grows to a maximum length of eight inches. 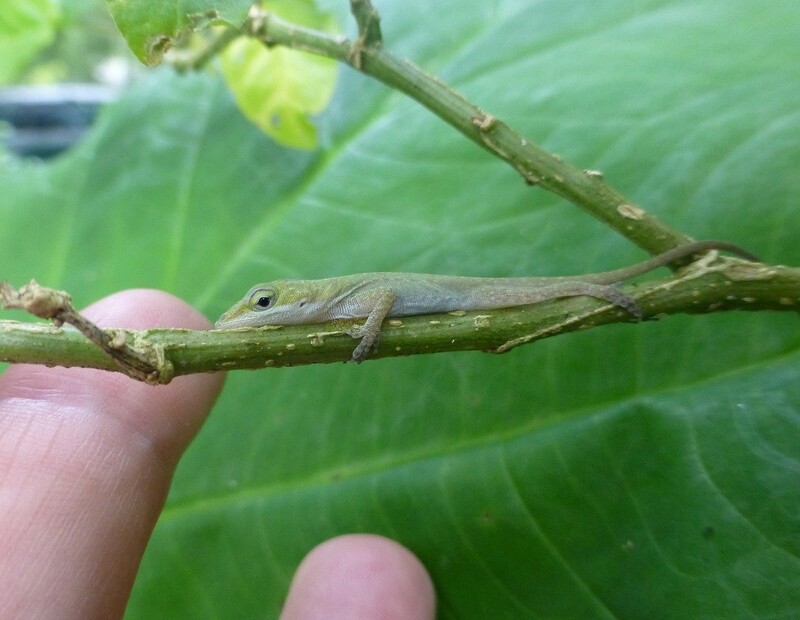 Immature anoles look like smaller versions of the adults. Their toes are long and slender with adhesive toepads that allow them to climb most surfaces. Their skin consists of very fine scales and they are a solid color. Green anoles do not have any dorsal ridges or splotchy coloration patterns but are a solid color pattern. Males display to attract females and defend their territories by extending their throat fan, or dewlap. The dewlap is a flap of skin under the throat that is extended outwards by the hyoid bone in their throats. Both sexes have dewlaps, but are larger and much more often displayed by the males. Dewlaps of green anoles are generally pink in color, but can be gray and green. Cuban brown anoles are orange-red with a thin yellow border. Their diet consists of invertebrates such as insects and spiders and will eat just about anything they can fit into their mouths. They are active during the day and can be found searching for food and maintaining their territory around homes and gardens. They prefer to hunt on vegetation, but can be seen moving from place to place via walls, rails, or decks. They do not generally forage on the ground like the Cuban brown anole, but prefer to stay at least a few feet above on low lying shrubbery and flowers. 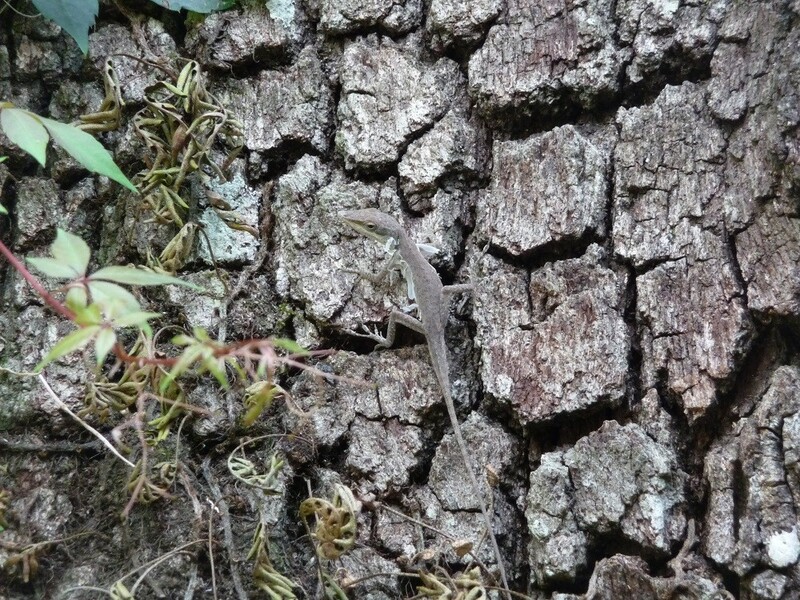 Possibly the invasive Cuban brown anole has shifted the green anoles habitat even further skyward. Green anoles move in a very stately fashion and rarely seem to be hurried or harried like the Cuban brown anole. They will generally let you be near them as they go about their business, but once you get too close or overstay your welcome they will gracefully move out of range. They don’t seem to possess the extreme flight response of the Cuban brown anole. Since they are in their native habitat going about their normal routine they have yet to have evolved the behavior. Of course they can move very quickly to get out of harm’s way, but normally are very mellow and calm. Green anoles mate from early spring on throughout the summer. The female lays one egg at a time in damp soil weekly throughout the summer, although it can be several weeks in between her egg deposits. Incubation time for the green anole is generally thirty to forty days. If you are lucky enough to have a green anole on your property … feel blessed and enjoy it while it lasts. Peter, Carmichael,. Florida’s Fabulous Reptiles & Amphibians Snakes, Lizards, Alligators, Frogs, and Turtles. Tampa, FL: World Publications, 1991. Print.